A lot of Americans, it seems, could use a GPS device to follow the news. Although the civil strife in Syria has been going on for more than two years and has been widely reported on, half of Americans surveyed couldn’t place that war-ravaged country on a map. 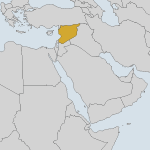 In a January survey by the Pew Research Center for the People & the Press (based on its latest News IQ Quiz), only 50% of respondents correctly identified the shaded country as Syria. Almost one in five (19%) thought it was Turkey, 11% said it was Saudi Arabia, and 5% said it was Egypt; 15% didn’t even attempt to answer the question. As one might expect, more-educated people were more likely to get the question right: 61% of college graduates correctly identified Syria, versus 56% of people with some college and 39% of people with a high-school diploma or less. But despite stereotypes about young people not paying attention to current events, 53% of people aged 18 to 29 got the question right — ahead of the 30-to-49-year-olds (52%) and those over age 50 (48%). Self-identified Republicans fared best on the Syria question: 55% got it right, versus 50% of independents and 48% of Democrats. While Syria has been the focus of much media attention, a survey in April found low interest about the subject among Americans. When allegations arose about possible Syrian use of chemical weapons, only 18% said they followed that news very closely while another 25% followed it “fairly” closely.